Measuring the thickness of a person's neck may provide as many clues to their risk of developing heart problems as measuring their waist, a study says. Researchers from the Framingham Heart Study found even those with relatively trim waistlines appeared to be at greater risk if they had larger necks. Risk was defined as having lower levels of "good" cholesterol for instance, or higher levels of blood glucose. The results were presented to a meeting of the American Heart Association. The US team looked at more than 3,300 women and men with an average age of 51. Professor Jimmy Bell of the MRC Clinical Sciences Centre said research was starting to uncover ever more evidence that health depended not on how fat a person was, but where their fat was located. 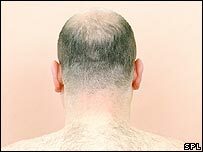 In this study, average neck circumferences were 40.5cm for men and 34.2cm for women. As neck circumference grew, so did risk factors. For every nearly-3cm more of neck, men had 2.2 milligrams of less good cholesterol per decilitre of blood (mg/dl) and women 2.7mg/dl. Good cholesterol - or high-density lipoprotein (HDL) - takes cholesterol away from the cells and back to the liver, where it is broken down. Having lower than 40mg/dl if you are a man, and 50 mg/dl if you are a woman is thought to put you at higher risk of heart disease. Neck size made no difference to levels of bad cholesterol - or low density lipoprotein (LDL) - which can cause harm, but it did affect blood glucose levels - for every 3cm more of neck men had 3.0mg/dl more and women 2.1mg/dl. A normal fasting blood glucose level is below 100 mg/dl - and an increased level is thought to be an accurate indicator of heart problems to come. While risk was higher regardless of waistline, it was compounded for those who had both a fat neck and who were larger than average around the middle. The team speculated that a fat neck may be a "crude measure" of upper body fat - which has been associated with heart risks. Professor Bell added: "What you don't want is fat around your liver or heart, and this can happen even if you look fine on the outside. Dieting isn't what you need to shift this - it's exercise."